High yields of single and viable cells, with preserved epitope integrity, are required for many downstream applications involving antibody binding. MACS Tissue Dissociation Kits allow the gentle, yet effective, dissociation of many different tissues. Together with the innovative gentleMACS Dissociators, optimized protocols combine mechanical dissociation and enzymatic treatment to yield single-cell suspensions with excellent viability rates and a high degree of standardization. Knowing your epitopes is a prerequisite for many downstream applications, including cell separation, flow cytometry, and cell sorting. Using crude enzymes for tissue digestions to obtain single cells can result in the loss of cell surface epitopes due to tryptic activity. Our guaranteed lot consistency of enzymatic activities prevents the unpredicted loss of cell surface epitopes. We have generated epitope lists for the Tumor Dissociation Kits, mouse and human that include more than 200 epitopes, which have been analyzed after the dissociation with the three enzymes included in the kits, respectively. 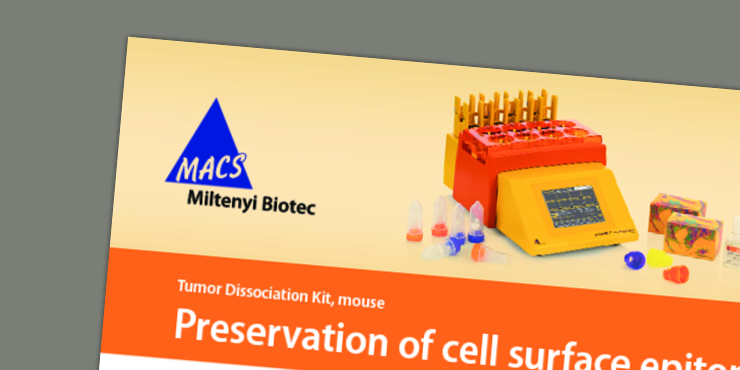 The Tumor Dissociation Kit was developed for gentle suspensions from solid tumors. The results show that the vast majority of more than 200 epitopes tested is well preserved during enzymatic treatment. Watch how the gentleMACS DIssociator can help speed up your tumor dissociation workflow. Watch how the gentleMACS Octo Dissociator with Heaters can improve your workflow for the preparation of of single-cell suspensions.